Special ALMEMO® software programs give you complete control of the whole measuring setup and ensure convenient device handling. Once measured values have been acquired by the ALMEMO measuring instrument / data logger, this data can be transmitted to a computer via modem, data line, optic fiber, or radio link. 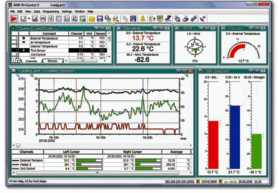 “AMR-Control”, the WINDOWS configuration software, is included free of charge with all ALMEMO devices. This software package lets you program all the device parameters and scan all measured data via a single computer. The “WinControl” package has been specially developed for data acquisition and measured data processing with ALMEMO equipment. Acquired measured values can be displayed, arithmetically processed, stored, printed out, and exported to other software applications for further processing. Therefore, ALMEMO measuring instruments / data loggers can be addressed in an already established corporate network.